Olympus offers a complete advanced phased array integration solution that meets the requirements of your most demanding customers. The solution includes the FOCUS PX, a powerful and scalable acquisition unit; FocusPC, a powerful data acquisition and analysis software program; and two software development kits (SDK), FocusControl and FocusData, to customize your software interface based on your application and control FocusPC for a fully automated inspection solution. 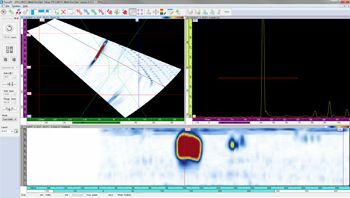 The FOCUS PX provides excellent phased array signal quality using the latest Olympus technology, resulting in significantly improved signal-to-noise ratio. The FOCUS PX is equipped with the latest phased array technology to deliver significant performance enhancements and faster inspection speed in highly demanding applications. Up to four FOCUS PX units can be used in parallel, offering a significant increase in inspection speed and advanced multiprobe configurations. The optimized FOCUS PX communication process significantly reduces programming time, resulting in minimized cycle time and improved operator experience. The FOCUS PX is a rugged unit that is designed for integration in harsh production environments. Designed for IP65 rating, the casing has multiple fins for optimized heat dissipation. The FOCUS PX bumpers can be easily removed to access four screw holes for mounting the unit directly onto a scanner or inspection system. Multiple FOCUS PX units can be synchronized with each other through a simple cable configuration. This allows all I/O signals to be received by one unit, reducing cabling and greatly simplifying the overall integration. Easy and quick installation allows the FOCUS PX to be positioned much closer to the probes, reducing cabling and optimizing signal quality. Four screw holes are available for mounting the unit directly onto any inspection scanner. Olympus offers a complete advanced phased array integration solution that meets the requirements of your most demanding inspections. 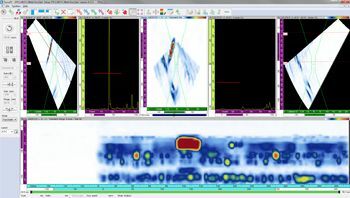 The solution includes the FOCUS PX, a powerful and scalable acquisition unit; FocusPC, a powerful data acquisition and analysis software program; and two software development kits (SDK), Remote Control and Data Access, to customize your software interface based on your application, and control FocusPC for a fully automated inspection solution. FocusPC is designed to give easy access to the most commonly used features, improving user experience and efficiency. 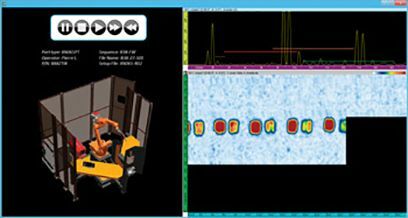 Quick access to the design, calibration, inspection and analysis features. Freely subdivide and reorganize the different views. Convenient group and inspection sequence management. PA, UT, and TOFD acoustic configurations. Beam delay, sensitivity and TCG calibration. Part geometry and automation management. Powerful features for optimized data analysis. FocusPC contains high-performance acquisition features that maximize the FOCUS PX performances and optimize inspection speed. FocusPC can drive up to four FOCUS PX units in parallel, enabling advanced multiprobe configurations and further reducing cycle time. The FOCUS PX seamlessly connects to any computer that has FocusPC installed, greatly simplifying the configuration process. 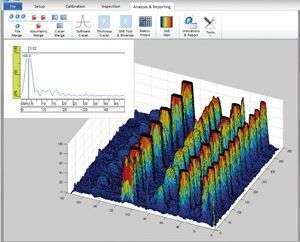 Advanced analysis tools are available in FocusPC so that you can get the most out of your FOCUS PX inspection data. Use the advanced data processing algorithms to extract valuable information and make the analysis process more efficient. FocusPC has fully customizable displays that can be adapted to better serve specific application requirements. Each view also has multiple customizable options, optimizing user experience and operator efficiency. Freely subdivide and reorganize the different views to create optimized setup, acquisition, and analysis layouts. In addition to the FocusPC acquisition software, Olympus offers three software development kits (SDK), FocusControl, FocusData and OpenView SDK, to customize your software interface based on your application and control FocusPC for a fully automated inspection solution. For applications that require specific features or a specific interface not offered by our standard software, the OpenView SDK enables you to create your own interface with the features required for your application. OpenView SDK is compatible with InspectionWare from UTEX and the HaroUT LabView library from Harotek. Build dedicated user interfaces based on the application requirements and make the inspection process more efficient. This provides better system workflow control and helps reduce the chance of operator-related mistakes. 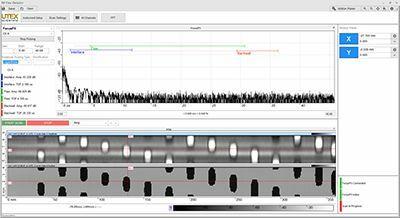 Use the FocusData and FocusControl SDKs to develop custom software to control the FOCUS PX and fully automate the inspection process, optimizing cycle time and improving overall system efficiency. 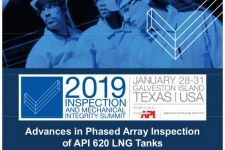 Use the SDKs to gain direct access to inspection data from custom software, enabling the development of application-dedicated data representations and customized analysis tools. 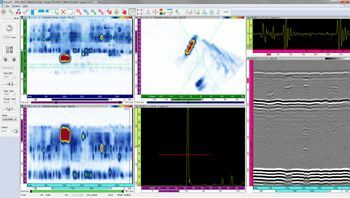 For high-performance heavy forging Inspection, the FOCUS PX uses the latest Olympus phased array technology to generate unprecedented signal-to-noise ratio (SNR). Four additional dedicated conventional UT channels are available for added flexibility in heavy forging inspection configurations. 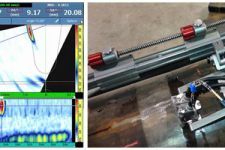 The high-end FOCUS PX specifications enable stir weld inspection (FSW) inspection to be performed at faster pace than ever before while maintaining unequaled signal quality. 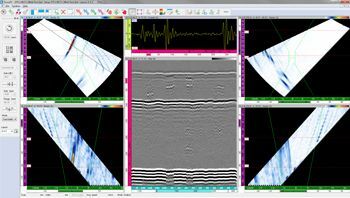 The high data throughput capability enables uncompressed A-scan to be retrieved without compromising inspection speed. Railway transport continues to play an important role in the transportation industry; due in large part to its speed, reliability, and affordability. To maintain this viability, ensuring train safety and integrity is key. Stringent regulations are imposed on the inspection of train wheels and axles in both the manufacturing and service sectors. To meet and exceed these strict criteria, Olympus provides the power and flexibility of its FOCUS PX/PC package to experienced and knowledgeable integrators, who are then able to deliver fully code-compliant inspection systems. Aircraft manufacturers and suppliers are under intense pressure to continually improve the inspection rates of the laminar composite parts used in planes. To meet this challenge, Olympus has developed a line of integrated instrumentation that is especially designed for high-performance composite inspection systems.